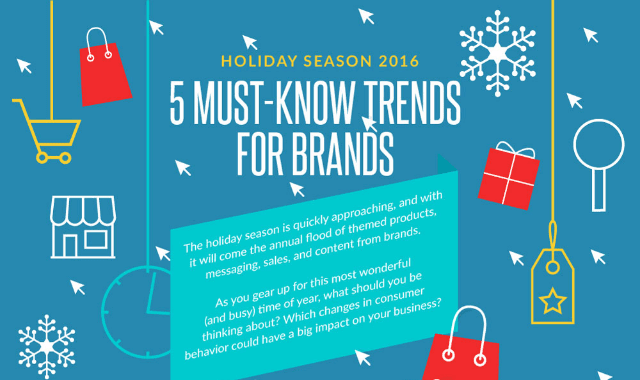 Holiday Marketing 2016: 5 Must-Know Trends for Brands #Infographic ~ Visualistan '+g+"
Brands and businesses are preparing for one of the most hectic, sales-driven times of the year: holiday season. During this time, brands find themselves trying to understand consumer behavior to further drive engagement and sales. MDG Advertising created a new infographic, Holiday Marketing 2016: 5 Must-Know Trends for Brands, from consumer surveys to emphasize key points highlighted from the previous two holiday seasons. The first important emphasis is on timing. Timing can impact consumer engagement significantly. A recent study on holiday-driven emails from 2014 to 2015 found that emails sent two weeks before the holidays had a 3% increase of open rates, compared to non-related messages. However, emails sent in the first two weeks of December experienced a 6% decrease in open rates. Another important trend to recognize is the omnichannel business model. Contrary to popular belief, traditional retail stores have not been completely wiped out by digital channels. According to the United States Census data, 92% of all purchases in the 4th quarter happened in retail stores. While digital’s growth cannot be denied, it’s important to understand these statistics to tweak your strategy. Next, it’s crucial to note that consumers actually prefer the freedom of a gift card to a physical gift. Because of greater changes in taste, customers may opt for more flexibility when purchasing. Also, holiday shoppers consistently struggle with procrastination. It has been found that less than half of all consumers purchase holiday gifts by Cyber Monday. Customers feel the need to hold off until better deals are unveiled, while also facing a good amount of indecision. These last-second shoppers can be crucial to your business strategy. Lastly, holiday shoppers constantly report feeling overwhelmed. About 17% of purchasers state dread or an intense dislike when holiday gift shopping comes to mind. As consumers feel bombarded with too many products, it is important as a brand to alleviate this purchasing anxiety. To learn how to maximize your organization’s efforts in marketing this season continue reading the below infographic.